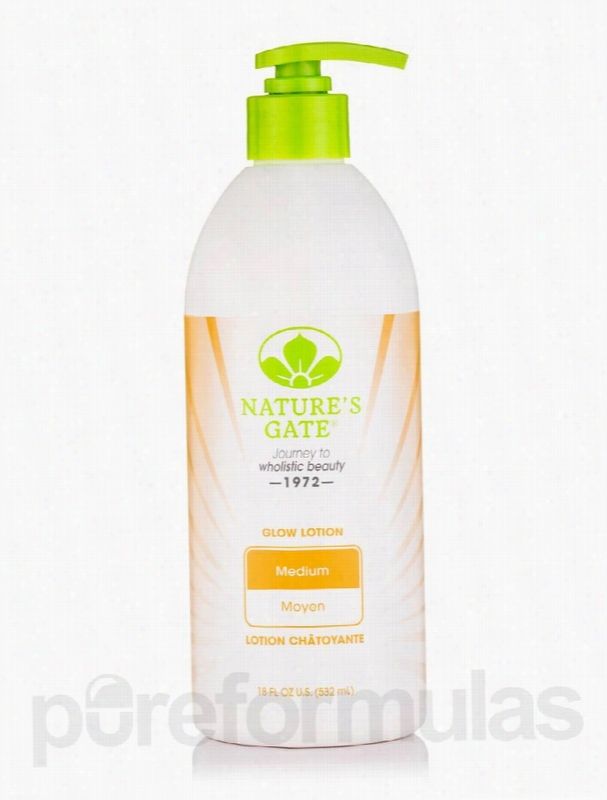 Nature's Gate Bath and Body - Medium Skin Tone Glow Lotion - 18 fl. oz. Getting a glowing tan is now easy with Glow Lotion for Medium Skin Tones - 16 fl. oz (473 ml) from Nature's Gate&reg;. This sunless tanning formula is enriched with natural essences including Shea butter&sbquo; soy&sbquo; rosehip oil&sbquo; algae extracts. Together&sbquo; they may provide a measured&sbquo; even-toned and natural looking tan&sbquo; while taking nourishing care of your skin for long-lasting radiance. Say hello to this all-natural color booster from Nature's Gate&reg; fortified with vital antioxidants and skin nourishing extracts. Clinical studies suggest vitamin-rich soy and rosehip oil work positively to alleviate skin blotchiness&sbquo; and may potentially have anti-aging properties. Rich in essential fatty acids&sbquo; it also helps promote collagen build up and maintains elasticity&sbquo; thus taking wholesome care of your skin. This exclusive moisture blend from Nature's Gate&reg; also includes the goodness of Shea butter&sbquo; which is believed to support the skin&rsquo;s surface&sbquo; and bring out soft and supple skin. Algae extracts promote moisture retention for dry and mature skin surfaces and conditions with deep-skin hydration. Get a sun-kissed look use after use and up your feel good quotient with Glow Lotion for Medium Skin Tones - 16 fl. oz (473 ml) from Nature's Gate&reg;. These statements have not been evaluated by the Food and Drug Administration (FDA). These products are not meant to diagnoseÃ¢ÂÂ treat or cure any disease or medical condition. Please consult your doctor before starting any exercise or Nutritional supplement program or before using these or any product during pregnancy or if you have a serious medical condition. Astara Antioxidant Body Lotion 8 oz. Nature's Gate Skin Care - Skin Therapy Lotion - 18 fl. oz (532 ml). Luxuriate in the comfort of nourished skin when you use Skin Therapy Moisturizing Lotion for Dry Skin - 18 fl. oz (532 ml) from Nature's Gate&reg;. Enriched with invigorating botanicals&sbquo; this formula may help smooth and soften skin&sbquo; and create a glow from within. This moisture-laden concoction may be useful in conditions like dry&sbquo; chapped skin. This unique all-over moisturizing blend from Nature's Gate&reg; embraces the goodness of aloe vera&sbquo; shea butter&sbquo; calendula&sbquo; Vitamins and a host of beneficial oils and herbs. Aloe Vera cools and soothes irritated skin and shields it from the harmful elements of nature. Soy helps tone skin color&sbquo; while Vitamin E may work as an antioxidant. Jojoba oil is absorbed easily and improves skin texture. Together with sweet almond oil and Shea butter&sbquo; the blend may work towards deep hydration and intense moisturizing. Soak in the all-round goodness of Skin Therapy Moisturizing Lotion for Dry Skin - 18 fl. 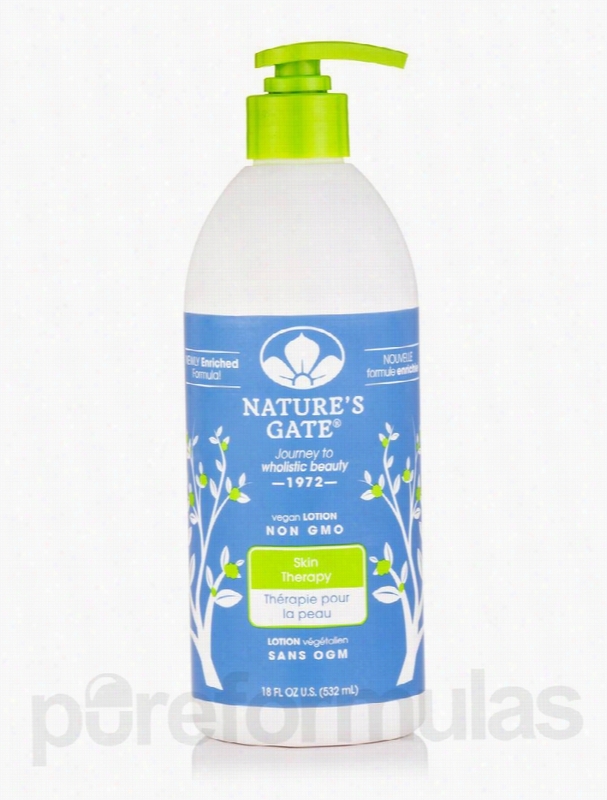 oz (532 ml) from Nature's Gate&reg; and take pleasure in silky soft skin. These statements have not been evaluated by the Food and Drug Administration (FDA). These products are not meant to diagnoseÃ¢ÂÂ treat or cure any disease or medical condition. Please consult your doctor before starting any exercise or nutritional supplement program or before using these or any product during pregnancy or if you have a serious medical condition. 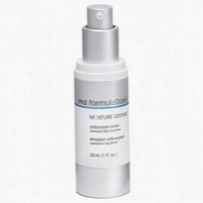 MD Formulations Moisture Defense Antioxidant Lotion 1 oz. Formerly known as Moisture Defense Antioxidant SerumWith four powerful antioxidants to defend against environmental stress and natural plant extracts for soothing care, this serum restores vital moisture and rebuilds the skin's protective barrier. It also provides smooth, supple skin. With continued use, fine lines diminish and moisture levels surge.Features & Benefits:Instantly restores skin's natural moisture. Provides barrier protection and increases moisture retention. Defends against environmental stress. Ideal for dry, combination and sensitive skin. Moisture Defense Antioxidant Lotion makes for an excellent After Shave as well. 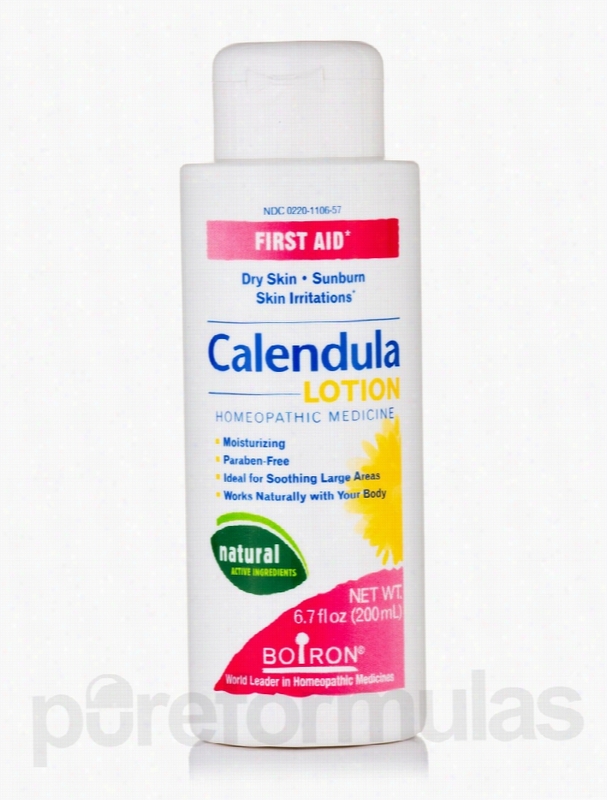 Boiron Homeopathic Remedies - Calendula Lotion (First Aid) - 6.7 fl.. The flowers of the Calendula officinalis plant&sbquo; also known as Garden marigold&sbquo; have been used topically for generations to naturally heal skin irritations. As the active ingredient in Boiron Calendula Lotion&sbquo; Calendula helps promote the healing of minor burns&sbquo; cuts&sbquo; scrapes and other skin irritations and relieves sunburn. It&rsquo;s a must-have for your family&rsquo;s first aid kit.The water-based Calendula Lotion is easy to apply&sbquo; making it ideal for covering large surfaces. Try it on sunburn or as a general hand and body lotion to moisturize skin dried out from sun&sbquo; wind or winter weather. The paraben-free lotion has no artificial colors or perfumes. These statements have not been evaluated by the Food and Drug Administration (FDA). These Products are not meant to diagnoseÃ¢ÂÂ treat or cure any disease or medical condition. Please consult your doctor before starting any exercise or nutritional supplement program or before using these or any product during pregnancy or if you have a serious medical condition. Caudalie Nourishing Body Lotion 8.45 oz. This anti-oxidant, moisturizing body Lotion provides silky skin and lasting comfort. Concentrated with moisturizing active ingredients plus anti-oxidant grape Polyphenols and draining ginkgo biloba, this lotion leaves the skin soft, firmed and radiant. Its delicately perfumed texture is instantly absorbed. Perfect as an after-sun product. Paulas Choice Skin Perfecting 1 Percent BHA Lotion Exfoliant 3.3 oz. Skin Perfecting 1% BHA Lotion Exfoliant has a lightweight lotion texture that works to reveal smooth, clear skin by exfoliating both the skin's surface and inside the pore. Because BHA helps reshape the pore lining, it unclogs pores and exfoliates the built up layers on the outside of skin while improving cell turnover rate. The result is healthier, smoother skin. This creates a dramatic improvement in the skin's appearance, feel, and function, especially if blemishes are a concern. There is a great deal of research indicating that BHA (Beta Hydroxy Acid) increases collagen production and drastically smoothes the surface of skin.Benefits:Attacks blemish-causing bacteria.Absorbs easily into the skin leaving behind a matte finish.Formula is colorant and fragrance free.Can be used by all skin types. Anthony Oil Free Facial Lotion 3 oz. Anthony Oil Free Facial Lotion smoothes, softens, and hydrates skin without leaving an oily residue. This lightweight, non-greasy formula absorbs quickly, ideal for normal to oily skin types. Silk Amino Acids and Soy Protein help reduce wrinkles and signs of aging, while Vitamin A and E nourish. Benefits: Hydrates skin without an oily residue.Smoothes and softens skin.Lightweight, non-greasy formula absorbs quickly.Ideal for normal to oily skin types. 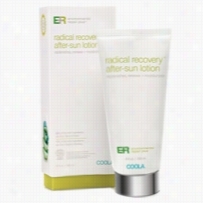 Coola Environmental Repair Radical Recovery After Sun Lotion 6 oz. Save the skin you're in with this ultra-moisturizing and deep-soothing Lotion that uses organic Agave's natural moisture binding mechanisms for environmental defense and calming sunburn. This miracle plant provides superior hydration and promotes collagen synthesis while offering UV protection and clinically proven relief from sunburn. Rich with organic ingredients, Radical Recovery After-Sun Lotion will nourish, repair and keep skin youthful and naturally glowing all year long.AgaveA soothing vitamin and antimicrobial-rich skin rejuvenator that offers natural protection from the elements.Aloe VeraA natural cell regenerator containing more than 200 biologically active compounds that shields the skin, keeping moisture in and pollutants out.Lavender OilA calming anti-inflammatory that helps heal and repair skin that has been over-exposed to the sun.Rosemary ExtractA refreshing and renewing toner which firms skin by reducing excess oils. Prevage AntiAging Moisture Lotion Broad Spectrum SPF 30 by Elizabeth Arden 1.7 oz. Skin Cancer Foundation RecommendationThe Seal of Recommendation is granted to products that provide effective UV sun protection and safely aid in the prevention of sun-induced damage to the skin.Allure Best of Beauty Award Winner 2011Category: Best SplurgesSelf Healthy Beauty Award 2010Category: Best Face SunscreenIf you want to help keep your skin looking its best, you need to moisturize while simultaneously protecting your skin from the environment. This lotion does both beautifully. This product is proven to deflect the sun with broad spectrum SPF protection while neutralizing free radicals with Idebenone, the most powerful Antioxidant available today. This formula immediately hydrates your skin and improves the texture of dry and sun-damaged skin to create a brighter, more radiant look.Benefits:Increases skin hydration levels.Leaves skin softer and smoother.Reduces the appearance of lines and wrinkles.Recommended for combination to dry skin types.